When getting together with my sister and brother-in-law, it is a time for playing games. This time, they brought one, and so I got to play Arkham Horror . 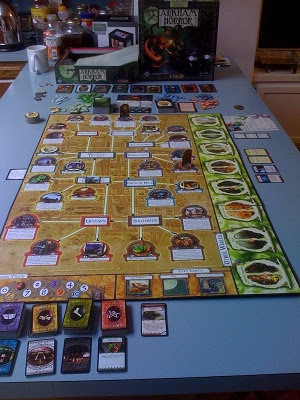 In Arkham Horror, each of the players takes on the role of an investigator attempting to determine what is causing the influx of monsters into the city of Arkham. When doing this, the investigators will often encounter monsters which they will either need to sneak past or fight, and will also be sucked through gates and find themselves in other worlds. Fortunately, if they can find their way back from the other world, they will have the opportunity to close (and maybe even seal) the gate that led them there - thus preventing more monsters from escaping from that world for a short time. If they are able to seal enough gates or close all of the open gates, then they are able to ward off evil and restore peace to Arkham. If they become too overrun with monsters, then they will either be destroyed or have to fight the supreme evil monster in an attempt to restore peace. Arkham Horror had several definite pros. The first pro was replayability. The game provides you with enough different investigators and supreme evil monsters (or whatever they are called) to play the game through several times without it feeling the same. The supreme evil monsters are also different enough and affect the game just enough that they prevent the feel of repetition (as opposed to a game like Castle Ravenloft where the game is the exact same until you get to the final monster). In addition, there are enough random monsters, items, encounters, etc that, though you will probably see the same ones several times if you play repeatedly, you will not feel like you know them all (until you play it a whole lot - but that happens with every game). The next nice aspect of Arkham Horror is that it is a very challenging but still possible to defeat cooperative game. This is a very difficult balance to reach, and shows that a lot of play testing has taken place. Many cooperative games are far too easy, which causes players to lose interest; many other cooperative games feel impossible, which has the same effect. Arkham Horror seems to be one of the games that has struck the difficult to achieve balance between challenging yet possible. However, it is not all roses and sunshine in Arkham Horror (ok, well, it is a horror game so none of it is roses and sunshine, but you get my point). The first aspect that detracts from the game to me is the length of time to play. Our first game took 5.5 hours, and the second one took "only" 2 hours (because we were completely decimated by the game). I think that if we were to continue playing this, it would average around 3.5-4 hours. This is a very long amount of time for most gamers, and so it will probably cause you to wind up playing this game less than most of your others. Plus it is difficult to keep my attention for quite that long, and, in fact, during the 5.5 hour game I found my interest occasionally waning. The next negative aspect that I found in Arkham Horror was that the encounters were a bit too random. The more you play the game, the more familiar you will be with the potential encounters, which will help solve this problem. However, when we played, we would have "Other World" encounters that could range anywhere from helping you gain Sanity, Clue Tokens, etc, to causing you to almost instantly die. It seemed very difficult to actually prepare your investigator to go into the Other World in an attempt to close a gate. This detracted from the strategy side of the game as you wind up just going to the Other World and hoping that you can make it, whether your character is at full health or about to die - it took luck to successfully make it through either way. Overall, I give Arkham Horror a 7.5/10. I debated this score anywhere from 7.0-8.5, as I think that some people will love the game and others will be less excited by it. I think that the two major things that will turn people off from Arkham Horror are the length and genre of the game. If these things don't deter you, however, then I would say you should try the game. If you really like the horror genre, I would also recommend Betrayal at House on the Hill, which is semi-cooperative and can be played quite a bit faster. As a final note, if you like zombies and horror themed games, you might also check out Nightfall, Resident Evil: Deck Building Game, and Zombie Dice.